Fresh greens, avocado, applewood smoked bacon, tomatoes, mushrooms, fried onion strings. Fresh, never-frozen certified angus beef®, American cheese, bacon, grilled onions, a.1.® sauce, potato bun. Fresh, never-frozen certified angus beef®, bacon, tomato, ranch, potato bun. Hebrew national® all-beef hot dog, pepper jack cheese, bacon, jalapenos, cholula®, mayo. Morning star farms® black bean veggie patty, cheddar cheese, pepper jack cheese, fried onion strings, lettuce, tomato, ranch, mooyah sauce, potato bun. All natural lean jennie-o® turkey iceburger, Swiss cheese, sliced avocado, BBQ sauce. All natural lean jennie-o® turkey, frank’s red hot®, ranch, crumbled blue cheese, pickles, tomato, potato bun. Fresh, never-frozen certified angus beef® topped with an all-beef hot dog, cheddar cheese, bacon, jalapenos, fried onion strings, ketchup, potato bun. All natural lean jennie-o® turkey, sliced avocado, bacon, lettuce, tomato, spicy ranch, multigrain wheat bun. Fresh, never-frozen certified angus beef®, cheddar cheese, onions, grilled onions, fried onion strings, lettuce, spicy ranch, potato bun. Hebrew national® all-beef hot dog, bacon, american cheese, onions, relish, ketchup, mustard. Morning star farms® black bean veggie iceburger, Swiss cheese, sliced avocado, tomato, spicy ranch. 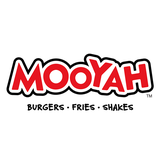 Fresh, never-frozen certified Angus beef®, American cheese, lettuce, tomato, mooyah sauce, potato bun. Fresh, never-frozen certified Angus beef®, cheddar cheese, applewood smoked bacon, grilled onions, BBQ sauce, potato bun. Fresh, never-frozen certified Angus beef®, Swiss cheese, sauteed mushrooms, fried onion strings, mayo, potato bun. Fresh, never-frozen certified Angus beef®, pepper jack cheese, applewood smoked bacon, fried onion strings, real mayo, BBQ, potato bun. Fresh, never-frozen certified angus beef®, pepper jack cheese, bacon, jalapenos, cholula®, mayo, potato bun. Fresh, never-frozen certified angus beef®, all natural grilled chicken, all natural hand-breaded chicken, all natural lean jennie-o® turkey, morning star farms® black bean veggie, or hebrew national® all-beef hot dog with your choice of buns, toppings and sauces. Fresh hand-cut Idaho potatoes (in house, every day) cooked in trans-fat free oil . Fresh hand-cut Idaho potatoes (in house, every day) cooked in trans-fat free oil. Cooked in trans-fat free oil. Fresh, never-frozen certified angus beef. Melted american cheese on potato bun. Hebrew national® 100% kosher beef.